In the pre-classic period the ships that travelled through the region of the Mediterranean Sea, according to findings of shipwrecks, as well as information from ancient texts, were built by the method "shell first". 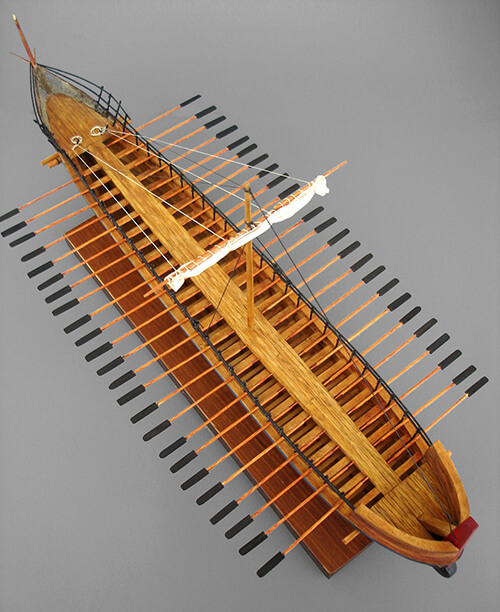 After the initial attempt to build canoes and papyrella, evolution in shipbuilding came in the form of "shell first". This technique can be described as follow: The shipwrights of the time, cut tree trunks and they formed them in order to get the desired shape. Then they connected the next shaped trunk using wood mortises and tenons. The reason that they did not use metal for the joining process, is obviously that it was expensive to create nails or not yet aware of the forging process. Thus, all separate elements functioned as a solid component which was getting the tolerances and strength of the raw wood. At the final stage of construction, shipwrights, insulates the hull of the vessel with tar and freeboard with tallow. This technique was maintained until the mid-Byzantine period, where the cost (materials and labor), became unprofitable. 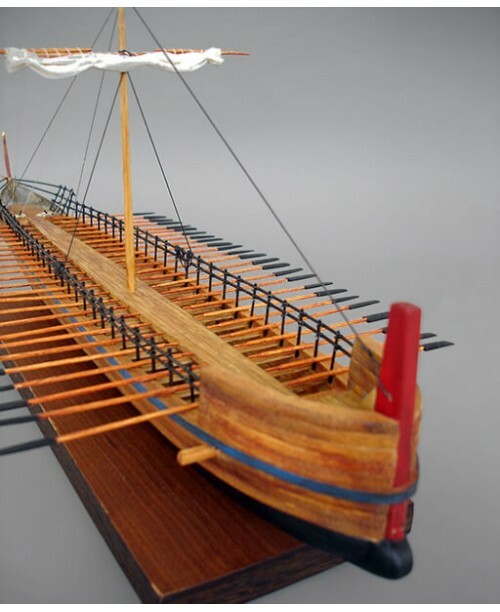 The types of vessels in that period were two: The strongylai (sort ) and the long ships. 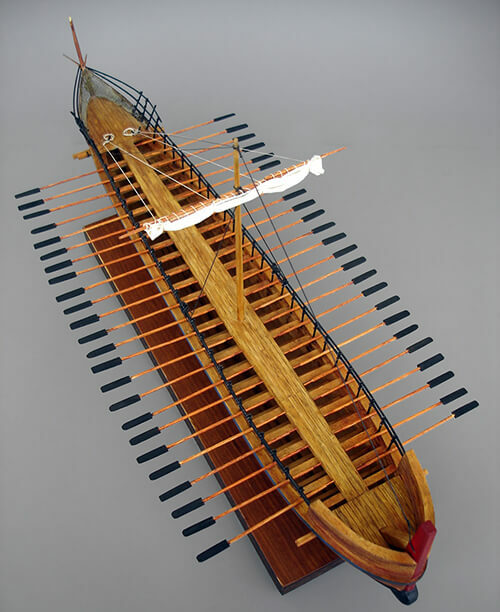 The first type mainly involved commercial vessels (Kyrenia Trade ship) and the second type included naval designs for longer trips and expeditionary purposes. 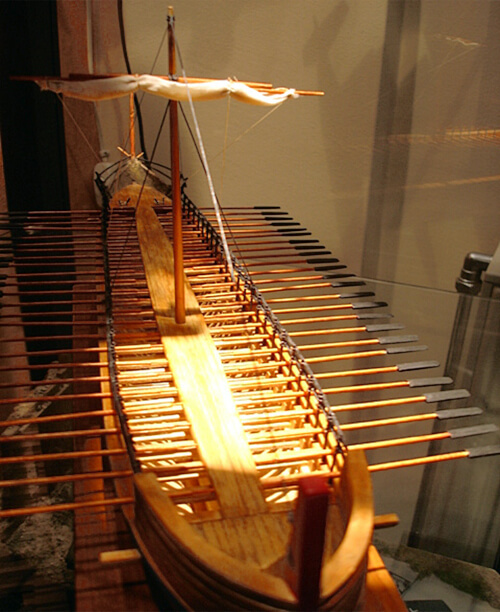 Such a sample of ship type is the monoreme pentikontoros. 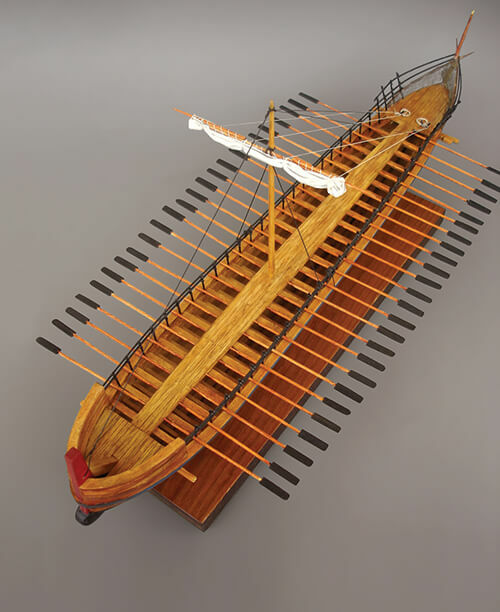 This type of ship was used by Jason and the Argonauts during their campaign .These vessels had a crew of 30 to 50, had two side rudders at the stern and a simple auxiliary sail. According to illustrations on ancient vases, bow was round and raised and stern was the end of the keel. The length to width ratio is calculated at 1/6, which is why they belong to long ship type. They additionally characterized as fast boats. From the second definition is concluded that it should not have a deep draft. Besides the Greek name "Argo", is translated as go-fast. 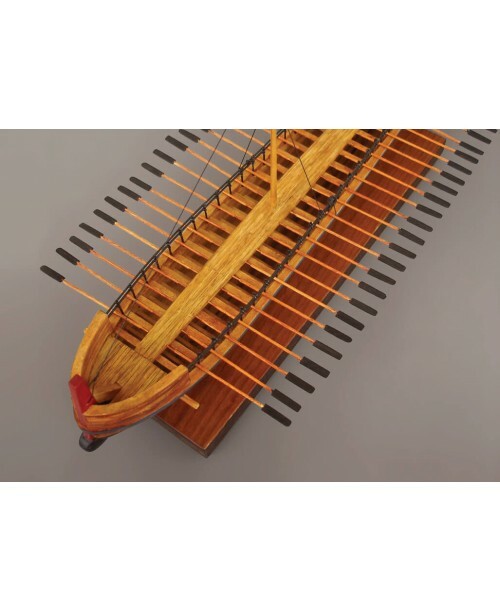 keel (keel), the esotropion/ keelson (connecting element between the two parts of the keel), steira (vertical foremost cutwater), the efolkio (embankment of the stem), the hull (made of pine, with the “shell first method”), benches and footrests of rowers (functioned as reinforcement structure ), the diazoma/walkway which was placed in the center of the ship from bow to stern, and finally the mast with a single square sail. From the height of the handrail and above there was a difrakto (double row of railings mounted on wooden poles), which connected the "castle" of bow with the net of the stern. The legend says that in 1400 b.c Argos was instructed by Jason in order to build a monoreme pentikontoros for the Argonauts Campaign. This boat, a typical example of that time, was manned by fifty rowers, twenty five in each side and had a simple auxiliary sail. It was constructed by the wood of Pelion, the sanctuary mount of Centaurs, with the help of the goddess Athena. It was named Argo, which meant go fast. There wasn’t any metal point (nail), but as it was used at that time, the individual parts were joined by mortise and tenons. What is myth and what is reality, was lost in these 3500 years that have passed. The Argonaut Campaign is described in the Argonautica text of Apollonius Rhodius. These epics, reveal to us the residents’ lives and habits of that era. The golden fleece may not existed, but the quest for precious and semi-precious metals and commercial goods in other places make voyages like this a reality. At the same time, we are aware of the presence of gold in the Colchis region. Metals were particularly useful for weapons or other daily needs. 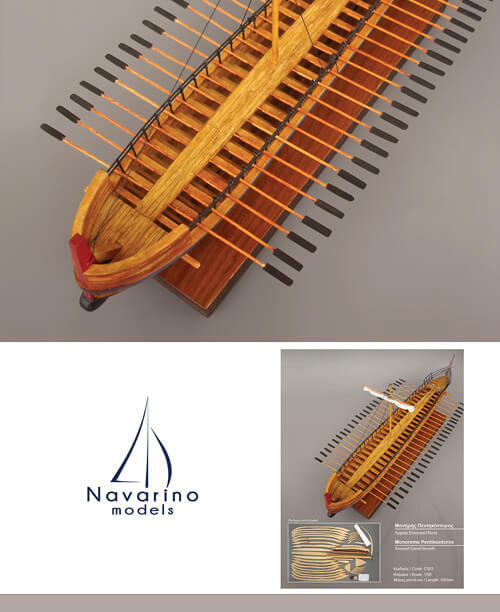 This perhaps is the reason why ships were constructed entirely by wood, saving valuable copper and iron stock for armor forging. Archaeologists have not found any evidence of the ship (which is rather logical for the age of such a wreck) but the absence of evidence does not mean that Argo ship is a myth. Excavations reveal ancient vases reflecting the form of ships as Argo and Argonauts in various activities. Also Herodotus describes in his IV volume of ancient Greek history : ". …Ιήσονα, έπειτεοι εξεργάσθη υπό τω Πηλίω η Αργώ.. ", that translated as :" ... because Jason built Argo at the foot of Mount Pelion "